Miss Lintott 1844 Chief Governess, C.D.S. Miss Trespass 1844 – 1849 Chief Governess, C.D.S. Miss Groom 1850 – 1865 Chief Governess, C.D.S. Miss Hamilton 1865 – 1879 Chief Governess, C.D.S. Over the years the type of education changed from the question-and-answer method and reports state that, by 1882, in Miss Beal’s time as Head Mistress, classification into Forms had begun. Also, in the same year, there is reference to Student Teachers, and entry for Oxford and Cambridge Local Examinations for Seniors and Juniors. Cookery was added to the list of subjects, but it had to be taken on Saturdays, so as not to interfere with the general education! In 1882 Miss Beal also applied to the Committee for the girls to be allowed to have a school magazine. Miss Kennedy came from a distinguished family, and was herself a first-rate Classical Scholar, although she did not possess a University Degree. In her day, a good Cambridge Higher Local Certificate was a passport to the Teaching Profession, but her Classical Scholarship was far in advance of its requirements. She was appointed the first Head Mistress of the Leeds Girls’ High School, when she was not yet 25 years of age, in 1876. From 1896 - 1910 for 14 years St. Elphin’s enjoyed the benefit of her great gifts. One or two pupils of the School had already made their way to Oxford and Cambridge, but it remained for Miss Kennedy to bring the school up to a steady Scholarship Standard. When Miss Kennedy left in February 1910, Miss Flood’s mother, Mrs Flood, carried on the reigns for 3 months until Miss Flood was able to take up her appointment. At the time Miss Flood was Head Mistress of the Truro County Secondary School for Girls. During Miss Flood’s term additions were made to the curriculum in 1917 including preliminary training in Secretarial subjects and a course of instruction in Personal Health and Hygiene. The years 1917-1918 proved extremely difficult owing to the war. Miss Flood introduced greater freedom for the girls such as allowing the older ones to go for country rambles by themselves and, in 1927, an Inspection Report refers to the greater freedom which followed the provision of a Recreation Room. Miss Flood gave her name to Margaret Flood House which was formed in 1959. A party was held at the school to celebrate her 90th birthday. Under Miss Hudson the financial position of the school became stabilised and the numbers of girls increased – this was partly due to the admission of day girls and weekly boarders. Miss Hudson was instrumental in having important structural alterations carried out, of which the beautiful Common Room and the enlargement of the Chapel were the most valuable for the well-being and comfort of the girls. They were also able to enjoy still greater freedom through improved means of recreation. Miss Hudson was also responsible for improving the equipment of the School. Electric light was extended to all parts of the buildings; the laundry and kitchens were equipped with modern electrical apparatus, the dormitories with new beds – to name but a few. Miss Hudson died in office, as Principal of Hockerill Training College on 23rd June, 1961. 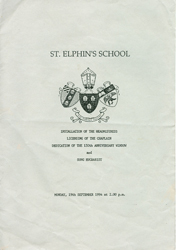 Sources: The Story of St. Elphin’s School 1844-1944 by Margaret L. Flood; 1944 School Magazine - E.M.J. ; 1961 School Magazine – Miss Robinson's Report. Eveleen Emily Stopford was born on 23 February 1897. She was the daughter of Francis Powys Stopford and Kathleen Edith Gompertz. She died on 11 March 1971 at age 74, unmarried. Eveleen Emily Stopford graduated from St Hugh’s College, Oxford University, Oxford with a Master of Arts (M.A.). Miss Stopford was formerly Head Mistress of St. Mary’s Hall, Brighton. She was also Principal of The Deaconess HIgh School in Jamaica from 1926 to 1931. Miss Robinson was appointed Head Mistress in 1958 after having been at Abbots Bromley, St. Felix, South Wolds and Talbot Heath Schools as Senior Classics Mistress. Rosemary Chambers (nee Thornton) stated, “Miss Robinson was fluent in both Greek and Latin and had high academic standards for “her girls”. Beneath a rather fierce, even tyrannical, exterior there was a very kind heart. 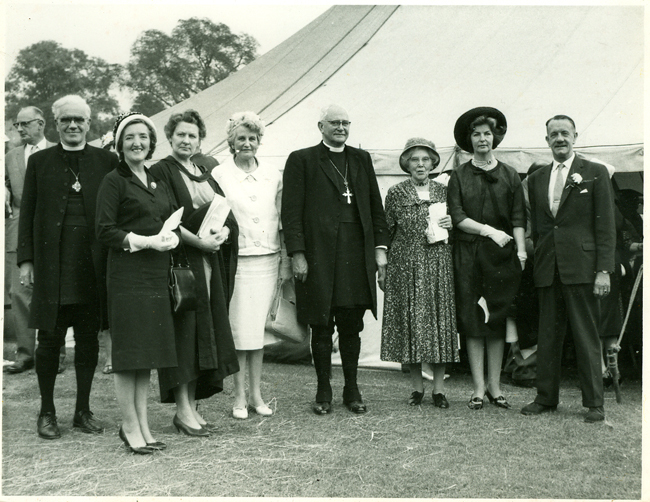 Upon her retirement in 1975, Miss Robinson moved back to Dorset where she continued playing golf and was very involved in her local community and church and became a Deaconess. She died on 17 August, 2003, aged 94”. Miss Mayhew, who graduated from Girton College, Cambridge, in Classics and Theology, was Head of the Classic Department at Sydenham Grammar School for Girls and later held a similar post at Ealing Grammar School for Girls. She became Deputy Headmistress and Acting Headmistress at Lewes Grammar School and subsequently returned to Ealing Grammar School (now reorganised as Ealing High School for Girls) as Deputy Headmistress. Mr Pollard was the first Headmaster at St Elphin's. He went to St Elphin's with a wide experience as Headmaster in another girls' boarding school, the Abbey School in Malvern Wells. He was appointed by the Governing Body as they felt he had a sensitive grasp of the actue problems that surround the word "discipline" in modern day society. His experience in sixth form work was also considered to be a very great asset to St Elphin's as the school headed towards the next Century! Source: St Elphin's School Magazine 1979 – Michael Warrington, Lord Bishop of Warrington and Chairman of the Governors of St Elphin's. Mrs Fisher was previously Head of a girls' school in Richmond, North Yorkshire. She was an honours graduate in Theology of Manchester University and had previously taught in schools and colleges in Harrow, Bournemouth, Nelson and Colne and elsewhere. She was the first married Head Mistress at St Elphin's. Mrs Taylor had previously taught at The Autherley School, Southampton King Edward VI, Southampton Lancing College, Bootham School, York College for Girls and Queen Ethelburga's College, York. Dr Mouat was first appointed as Deputy Head in September 1999 and became Acting Head Mistress in 2000 - filling in the gap between Mrs Fisher and Mrs Taylor. However, in 2003 Dr Mouat became the Principal. Dr Mouat took a B.Sc. in Chemistry followed by a PhD in Organic Chemistry. Before teaching she worked for Beecham Pharmaceuticals (Smith Kline Beecham) in the Sales and Marketing Division. Prior to going to St Elphin’s she was at Mount St. Mary’s College where she went from Teacher of Chemistry to Head of Science, to Examinations Office and finally to Director of Studies.